For almost four years and 360+ posts, Zeh Lezeh has been our blog’s home. We have heard from experts, educators, community leaders, parents, siblings, philanthropists and members of our community. The blog has grown and become a place where we can discuss inclusion and how to move our society forward. But alas, it’s time for this part of the journey to come to an end. Starting tomorrow (Thursday March 12), the blog will move to its permanent home on our foundation’s website and Zeh Lezeh will be shutting its doors. The email itself will look a little different than what you have been receiving until now. We encourage you to open, click and read. So as we bid a fond farewell to Zeh Lezeh, Dear Reader, we look forward to continuing the conversation in a new place. Thank you for subscribing, reading and commenting. We enjoy receiving your feedback and are always happy to hear from you. 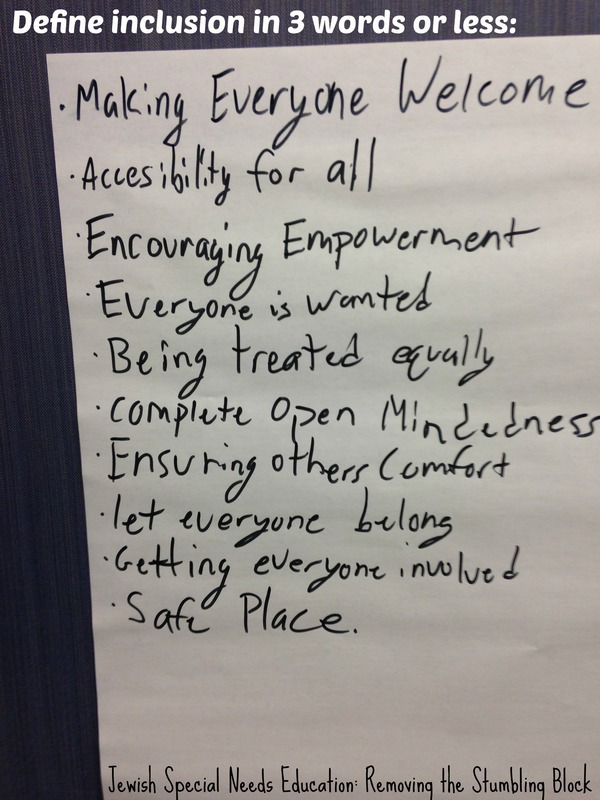 When I conduct professional workshops and trainings for Jewish leaders seeking to become more inclusive, I typically begin by asking them to share their definition of inclusion. (There are fun & catchy ways to do this, and most recently I have been using the prompt define inclusion in three words or less.) The reason for this set-induction is two-fold: first, it focuses participants on the task at hand and second, it helps participants to recognize, up front, that there is no universal definition of inclusion. You may be wondering why that matters. No universal definition or standard of inclusion means that individual organizations and school districts must figure out for themselves what inclusion means and how it might best be accomplished in their setting. The Americans with Disabilities Act (ADA) guarantees that people with disabilities have the same opportunities as everyone else to enjoy employment opportunities, to purchase goods and services and to participate in State and local government programs and services. The Individuals with Disabilities Education Act (IDEA) governs how states and public agencies provide early intervention, special education and related services to infants, toddlers, children and youth with disabilities. Both of these laws prohibit discrimination. Both laws describe appropriate accommodations. But neither actually defines or explains what it means to be inclusive. As a result, there is tremendous variation from state to state and district to district. It gets even more complicated for us in the Jewish world. As private, religious institutions we are not bound by the ADA or IDEA. There are no legal mandates requiring us to make accommodations for and/or offer inclusive opportunities for people with disabilities and their families. Advocates of an inclusive Jewish world know that the inclusion of Jews of all abilities is the right, moral and just thing to do. We know that we must look past legal mandates and turn, instead, to our own Jewish teachings and sensibilities to guide us to do what is right. But without laws or specific mandates, Jewish leaders find themselves without the proper support and guidance to make inclusion a reality. How do we start? What do we do? Must we focus on our structures or on our people? How can we seek to bring more people into our community if we can’t accommodate their needs once they are there? Why is it that some people feel inclusion means everyone all together all the time while others prefer a balance of separate and inclusive opportunities? How do we choose what is right and what is really inclusive? Inclusion is NOT a favor you do for someone. Inclusion is NOT a social action project or something your social action committee is “in charge of handling.” Inclusion, when it is part of the culture of a community, offers everyone an opportunity to participate in a wide variety of meaningful experiences. Inclusion is NOT accidentally sending the message to be thankful that you are “whole.” This is the “I’m so lucky I don’t have (fill-in-the-blank)” message. This conveys a message of pity rather than a celebration of the gifts each person has to offer. In the end, the message is clear: inclusion matters, legal mandates or not. It is incumbent upon each organization to develop an understanding of inclusion and work toward creating a vibrant community that includes and supports everyone. 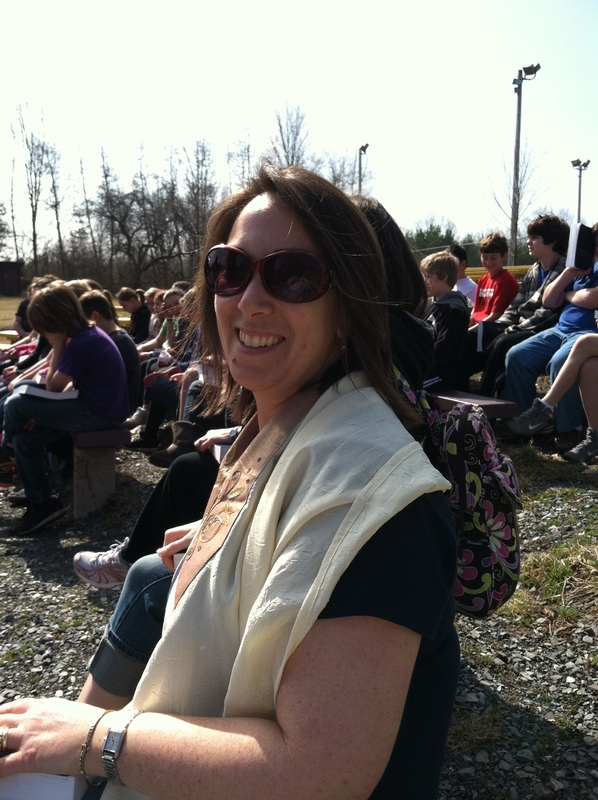 Lisa Friedman is widely recognized in the field of Jewish Special Education. She is currently an Education Director at Temple Beth-El, a Reform synagogue in Central New Jersey, where she has developed and oversees an inclusive synagogue school. 2015 Jewish Disability Awareness Month just finished- and what a month! Programs across North America, new initiatives announced, many many posts and articles and plenty of tweets on Twitter! Below is a list of fifteen posts and articles we selected that discuss inclusion from numerous angles. They are not listed in any specific order. Please read them and spread them around. Thank you to everyone who participated in #JDAM15 and who continues to work towards a fully inclusive Jewish community! Inclusion is Great. Now what? What if you Can’t Swim? The case of Moses is an example par excellence of what can happen when a person is appropriately facilitated and included. Benji became Sam’s favorite bar mitzva student by demonstrating that everyone has ability. They just need someone to help them bring it forth. A bar mitzvah boy embraces his dyslexia and sets to help others reach their full potential. We are happy to announce the launching of the fourth annual Ruderman Prize in Inclusion global competition. The Prize aims to recognize organizations around the world who have demonstrated their commitment to the full inclusion of people with disabilities into the Jewish community through innovative programs and services. The $250,000 prize will be split equally by five organizations. Over the last three years, twenty organizations worldwide have been recipients of the Prize, including organizations in Russia, the U.K., United States, Mexico, Israel, South Africa, Australia, Canada and Argentina. Past winners include schools, a synagogue, dance company, JCC, university, bakery, employment service and organizations that promote full inclusion for all Jews, whether they have a disability or not. Fully inclusive programs ensure that everyone can participate together, without stigma or imposed limitations. The Ruderman Prize in Inclusion shines a spotlight on programs and organizations around the world whose work best exemplifies the full inclusion of people with disabilities, celebrating them as inspiration and models which could be replicated elsewhere. The Ruderman Prize in Inclusion is a signature program of the Ruderman Family Foundation, which believes that inclusion and understanding of all people is essential to a fair and flourishing community. Guidelines and a link to the application are available online. Submissions are due by Monday April 20, 2015 and the winners will be announced in June. I am dyslexic. Dyslexia is just a fancy word to describe a uniqueness in the way my brain is wired that makes me learn differently from most people. I have embraced that being dyslexic is just one part of who I am and I have grown to be very proud of that. Part of accepting my reality was appreciating that my differences could help others feel a part of something much bigger than the isolation they may feel by being singled out as being different or learning disabled. I now appreciate that part of my purpose in life is helping other dyslexic kids feel the way I do now… proud of who I am and confident that I can accomplish whatever I set my mind to. My Torah portion (Shemot, Exodus 5) talks about another person with a uniqueness that made him seem different at first, but then helped him become an important leader of the Jewish people. Our ancestor Moses was very self-conscious about what he felt was a disability. Jewish teachings tell us that Moses stuttered intensely when he spoke. Moses was so concerned about how others would perceive him as God’s messenger that at the burning bush, when God told him to go to Egypt to get Pharaoh to let God’s people go, Moses begged God to choose someone else. Moses did not think that he was good enough to do God’s work. But God does everything for a purpose, and He wanted Moses to be His leader. To meet God’s expectations of him, Moses and God created a plan. God sent Moses’ brother Aaron to be Moses’ spokesperson. Just like Moses, sometimes to get over hurdles in our lives, we just need to make a plan and look outside ourselves to find the tools we need to accomplish our goals. I wanted to become a Bar Mitzvah ever since I was in second grade. That was the year my teacher told me that I would never accomplish anything because I was lazy and could not read. Over and over again that year, my teacher reminded me that my work was not good enough and compared me unfavorably to my classmates. I felt horrible about myself and I was just 8 years old. I had my whole life ahead of me, and I was being told that I wasn’t good enough. At that time, I did not know I could speak up to a teach, that I could advocate for what I needed to be able to learn and keep up in class. Imagine if God had responded like my teacher, telling Moses that he was not good enough or that he was too lazy to meet God’s expectations of him. With this self-doubt, Moses likely would not have gone to Pharaoh because God would have crushed his self-esteem and willingness to keep trying. Instead, I imagine that Moses had the resilience to persevere, working as hard as necessary to do his assigned work. The Torah talks about working hard without the support of others. Earlier in Exodus, Pharaoh gave the Israelites straw and mud to make their daily quota of bricks. Later, Pharaoh forced them to find their own straw and mud and still make the same number of bricks each day. This reminded me of recent research that shows that providing dyslexic students with accommodations like extended time for tests and teacher lecture notes only levels the playing field for those students. It does not provide them with any advantage over non-dyslexic students. Without accommodations, people with dyslexia must work on average ten times harder to keep up with and complete the same amount of work as their classmates or work partners – just like the Israelites who had to find their own mud and straw. I thought becoming a Bar Mitzvah would be ten times harder for me, and sometimes it was. Once we joined Congregation Or Ami, which is very welcoming to all children, and I began working with my Bar Mitzvah tutor Diane Townsend, I knew I was in the right place. I knew in my heart that I could make this happen. Diane was there with me every Monday reminding me how to practice so to I could make myself proud. Thankfully, she believed in me too. My rabbi, Paul Kipnes, teaches that when we are involved in Tikkun Olam (repairing the world), we are actually partnering with that Force in the world that created and sustains existence. To me, that partnership is what God is…the feeling we get when we are working together to make the world a better place. Over the years, I wanted more of that feeling in my life. For my mitzvah project, we reached out to Learning Ally, a non-profit focused on making books accessible to people with visual impairments and dyslexia. Learning Ally’s audiobooks help me so much. When I hear the words and follow along in my book, the material sinks into my brain much better. I use the app a lot to read textbooks to help me keep up with the pace of school. Since audiobooks, especially textbooks, aren’t always easy to find, I wanted to make the Learning Ally tool available to other dyslexic kids whose schools or families cannot afford to join Learning Ally. To help others learn about dyslexia and the Learning Ally tool, I partnered with Learning Ally to build a presentation, community engagement plan and webpage. I am encouraging others to learn about dyslexia, volunteer to record audiobooks, send a letter to legislators to support a dyslexia bill pending in the U.S. House of Representatives, and/or donate money to help kids like me gain access to Learning Ally. I also started raising awareness about dyslexia at local schools and the importance of self-advocacy to other dyslexic kids. I am meeting with school principals and have hosted a self-advocacy workshop for dyslexic kids and their families with Learning Ally and the local chapter of the International Dyslexia Association. Dyslexia is my life and I embrace this reality. Judaism teaches that Jews are Am HaSefer, the people of the book. This means that we place a very high value on learning throughout our lives. With Learning Ally, my Congregation Or Ami, and my work raising awareness about dyslexia, I am making sure that all people, even those with reading challenges, can embrace learning. My son, Benji, was diagnosed with an autism spectrum disorder at the age of two and a half. One of the characteristics of autism is the preponderance of obsessive or perseverative interests that can become a single-minded focus, becoming all the individual wants to talk about. Common obsessive interests for kids on the spectrum include trains, sports teams, snakes, prehistoric animals, computers and electronics. My own son’s special interest is everything to do with Judaism, and particularly Jewish customs and rituals. He has had this special interest since the age of two; he is now 19 and it has never wavered. He has always been happiest when he is praying. When he was four years old, the psychologist who used to do his annual psycho-educational assessments was interested in evaluating his imaginary play skills, since lack of appropriate imaginary play is a hallmark of autism. She asked him to role-play something with her, suggesting playing house or playing doctor as possible choices. He replied, “Let’s play synagogue. I’ll be the rabbi.” The psychologist had never been to a synagogue before and didn’t know how to play. 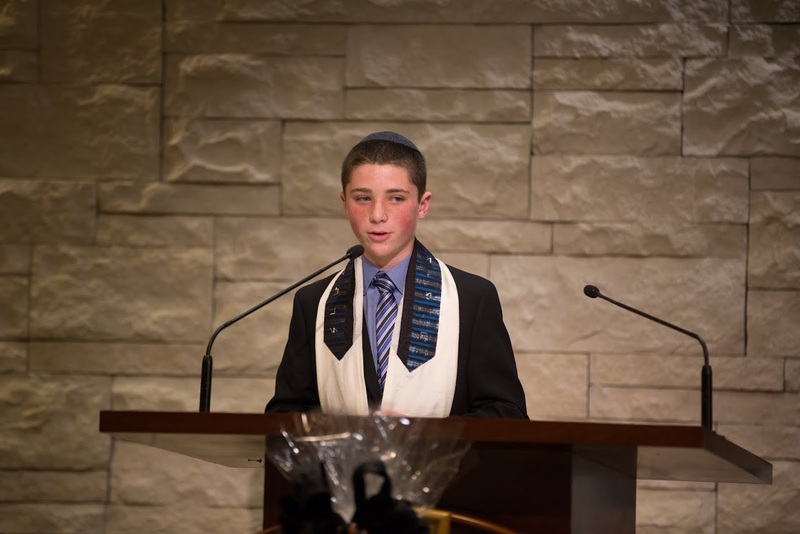 For Benji, his bar mitzvah lessons were the highlight of his life. Not only did he devote countless hours to practicing each and every day, he became so absorbed that when he wanted to just relax in his bedroom, he would listen to Sam chanting on his cassette player. Each week after the Sabbath service, I would observe Benji approach Sam and tell him how excited he was for his upcoming lesson the following day. Gradually, Sam would beam. After all, how many 12-year-old boys had ever told him that and meant it so sincerely? 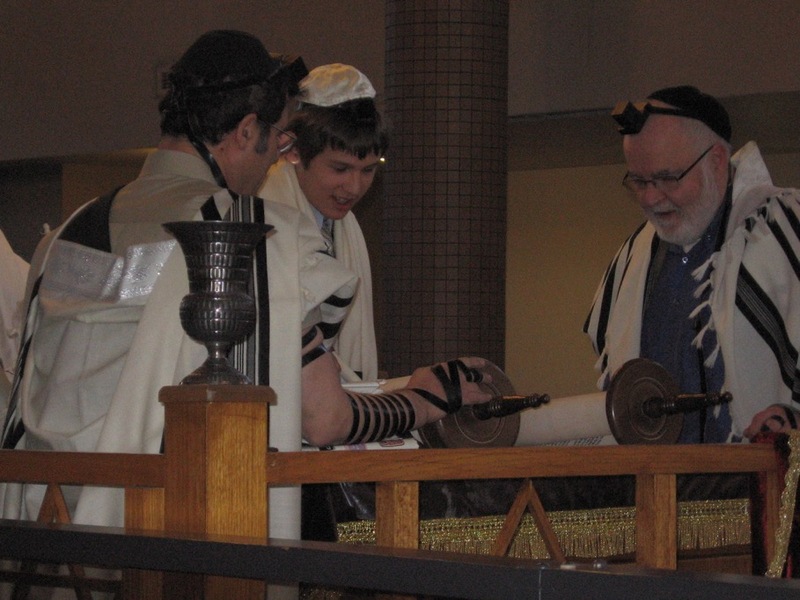 After three months of lessons Sam reported that Benji would be able to do everything expected of a bar mitzvah boy in an Orthodox synagogue, including the entire Torah reading, the haftorah (reading from Prophets), Musaf prayer service and Dvar Torah (speech). After six months, Sam claimed that Benji was the best student he had ever taught! At the bar mitzvah, Benji’s voice filled the sanctuary with the volume and confidence of a grown man. While it was difficult for me to see over the mechitza (partition), I heard from others that the same men who had been the most intolerant of Benji’s behavior problems when he was younger, were the very ones who were choking back the tears during his flawless Torah reading. When it was time for Sam to address him on the bimah (pulpit), he announced that tutoring Benji had been the most unparalleled experience of his 35-year career as a bar mitzvah tutor and he promptly burst into tears. If I told you that there was not a dry eye in the sanctuary, it would be a gross understatement as many congregants had tears streaming down their faces. Even our rabbi was too choked up to give his Dvar Torah, stating that he was too overcome with emotion to say a single word. For the next two weeks my husband and I were overcome by letters, emails, cards, flowers and library books donated in Benji’s honor. Most of these were not even from our invited guests, but from members of our congregation who had watched Benji grow up. We received letters from people telling us that Benji had inspired them to overcome all of their personal challenges in their lives. His bar mitzvah was a testimony to the resilience of the human spirit. A couple of days after the bar mitzvah, Benji left for summer camp for six weeks, returning in mid-August. The Friday morning after his return, Sam called to say that he wouldn’t be at shul the next day for Shabbat, but that he was ready to resume his more advanced Torah reading lessons with Benji that Sunday. When I informed him that we were going to take the rest of the summer off and would resume after Labor Day, I detected the disappointment in Sam’s voice. The once reluctant tutor could hardly wait to resume lessons with his favorite student! 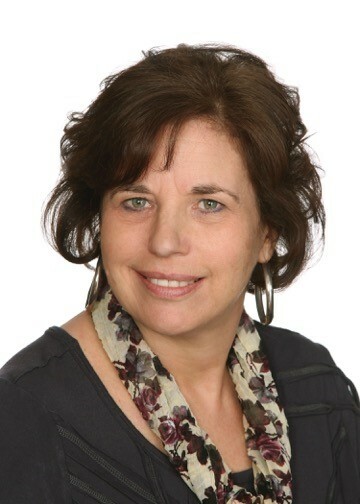 Sandra Morton Weizman chairs the Inclusion Task Force for the Calgary Jewish Federation in Calgary, Alberta, Canada. She is a Museum and Heritage consultant and the mother of two adult children, one of whom has an autism spectrum disorder. 1) The state Transport Minister called the below video “distressing.” Just distressing? 2) The article states that area residents have been involved in a TWENTY YEAR BATTLE to make the station accessible. Unbelievable. Hopefully the video will cause this “distressing” situation to immediately be taken care of by local authorities.